Time for The Talk will help fathers walk their sons through one of the most important conversations of their lives. "The Talk" is much broader than just a talk about sexuality; it's a conversation about manhood, about right decisions, about Christ. Time for The Talk will help you give your son what he needs to steer through the moral and spiritual confusion of this world and make wise, godly, character-forming decisions. You will be equipping him to enter true manhood a passage that many young men today simply never make. 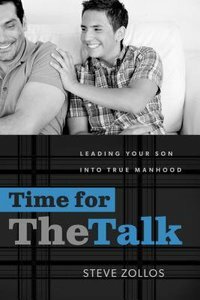 Time for The Talk provides a complete framework for discussing the key areas of manhood that every boy should learn from his father. Through "The Talk" you will open a channel of communication based on truth and love that will endure for life. About "Time For the Talk"